While it might seem a beginner could learn on almost any clarinet, having a clarinet that works properly is actually critical. Making the initial notes is challenging when the clarinet works as it should, impossible when it doesn't. A beginner who can't make the sounds or who makes the wrong sounds is quickly discouraged. Band directors can often predict a student will drop out of band by looking at the quality and condition of the instruments they begin on. 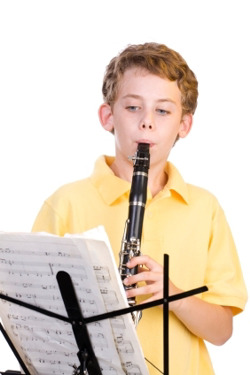 A beginner doesn't need an expensive clarinet, but s/he does need a clarinet that doesn't leak (require excessive air), is in correct adjustment (plays the correct notes when the right keys are pressed), plays in tune with the other instruments, and can be repaired and adjusted as it (inevitably) needs it. Buying outright. If you're sure your child will like playing music and will want to stay with the clarinet, buying a clarinet outright might make sense. However clarinets that are appropriate for band aren't inexpensive, and it's difficult to tell which model will be right for the long term until the student has played at least a few months. Renting. This is the most popular way to get a student started in music. Renting gives the child (and parents) time to see how s/he likes playing music, consider whether clarinet is the correct instrument, and consider what type of clarinet is right for the longer term. 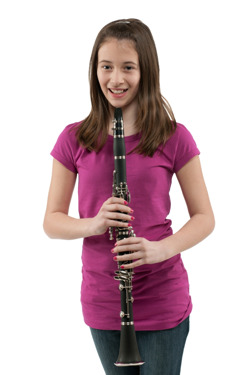 The band director knows and usually advises beginners' parents where they can rent the right kind of clarinet, considering not just the cost and quality of the clarinets rented, but also the condition they are kept in and the support the company provides to keep the instruments playing properly. Rent paid is usually applicable to the later purchase of an instrument. Internet. Although the Internet is considered a dangerous place to buy a musical instrument, someone who knows what they're doing and is careful can sometimes find a bargain. By some estimates 90-95% of the clarinets sold on the Internet are foreign off-brands and inappropriate for school band use; indeed many directors say they are the directors' and students' worst nightmare. However appropriate clarinets can occasionally be found on eBay and other Internet sites, sometimes at good prices. Once again, be sure it is a clarinet that is appropriate for band, and either check its condition carefully or anticipate repair costs as part of your purchase math, since a clarinet that has been sitting up virtually always needs pad replacement to play properly.